Yesterday, as I settled in with my pint jar of iced coffee (awesome idea and recipe at Pioneer Woman), preparing to send all three of the boys off to the Galleria and a day of ice skating so that I could share the deliciousness of Peanut Butter Cookies, there was a knock at the door. Of course, it was Mum, here to get said boys for the day’s adventure. She said, “Oh, why don’t you come with us? We’re lunching at Brennon’s.” No arm twisting necessary! Brennan’s??? FREE??? So I threw on a relatively presentable outfit, hair still in ponytail (unbrushed), no makeup (a.k.a. warpaint), and off we went. Lunch was fabulous, and was accompanied by mimosas, my current favorite girly drink. Mum had Grilled Shrimp with Cheesy Grits, Hubby had the Pecan Crusted fish, and the boys and I all had the Filet with Lump Crab. Excuse me while I get a tissue…I’m drooling again. 😛 We finished up with Lemon Meringue Pie with Blueberry Coulis, Bananas Foster, and of course, coffee. Then we headed to the Galleria for some icy goodness, which turned out to be considerable warmer than usual. 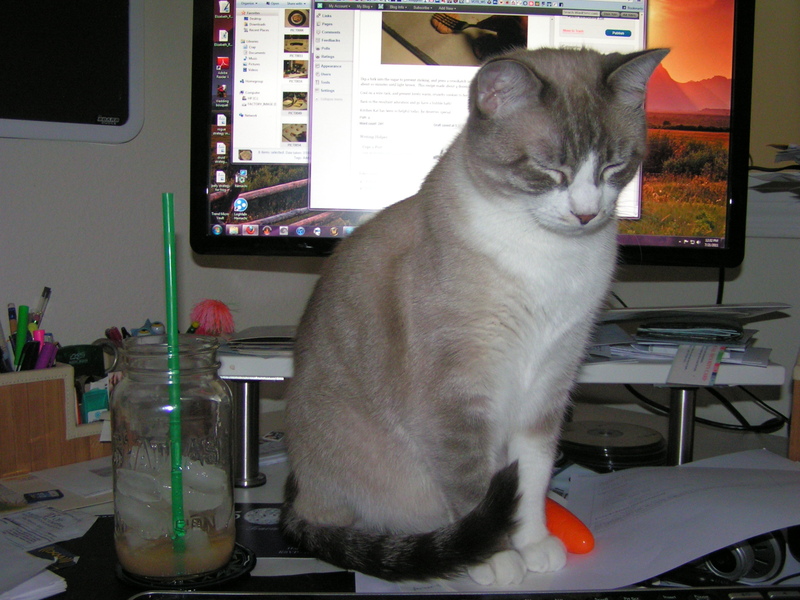 Now, a picture of Kitchen Kat, because it’s so much more fun to type when you’re in front of the monitor! Glad y’all had a great time. And tell that cat he makes a better door than he does a window!! Good to know it isn’t menopause…yet.